At the International Astronautical Congress Sept. 28 in Adelaide, Australia, Lockheed Martin experts are revealing new details of its Mars Base Camp concept including how it aligns with NASA’s lunar Deep Space Gateway and a Mars surface lander. 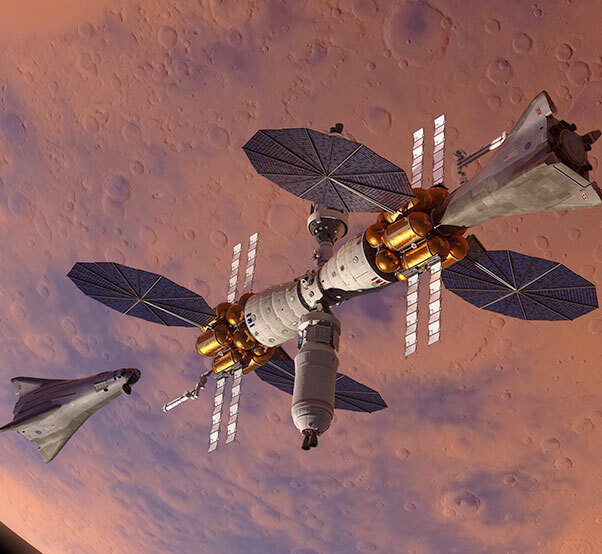 Mars Base Camp is Lockheed Martin’s vision for sending humans to Mars in about a decade. The Mars surface lander called the Mars Accent Descent Vehicle (MADV) is a single-stage system that uses Orion systems as the command deck. It could allow astronauts to explore the surface for two weeks at a time before returning back to the Mars Base Camp in orbit around Mars. A webcast (live or replay) of the Mars Base Camp presentation from IAC can be viewed on the Australia Science Channel web site: https://www.australiascience.tv/live-from-the-68th-iac-lockheed-martins-mission-to-mars/.